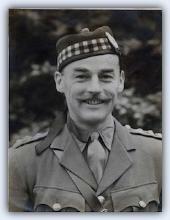 Captain Donald Roy, known affectionately as 'The Laird', led an Assault Party most of whom hailed from the 'Liverpool Scottish', and when they stormed ashore from Campbeltown, the majority were wearing kilts. Having knocked out the guns on top of the Pumping Station, Roy and his men then held a strategically vital bridgehead where, in spite of losses, they remained in place until all the dock Demolition Parties had passed through on their way to the Mole for re-embarkation. When this proved to be impossible, Roy was instrumental in executing a daring breakout attempt through enemy lines. With the number of wounded mounting, Donald went in search of water for them, chose a building which sadly transpired to be a police station, and was taken prisoner.